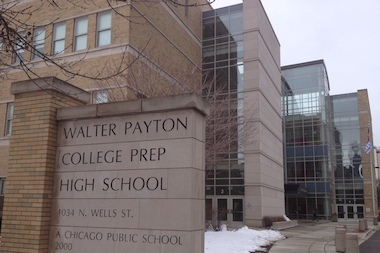 Walter Payton College Prep High School on the Near North Side was the toughest selective-enrollment high school to get into for the fourth year in a row, CPS said. NEAR NORTH SIDE — Getting into a selective-enrollment high school got even harder this year — so much so that members of next fall's freshman class at Walter Payton College Prep High School who won the coveted seats outright earned at least 898 points out of a possible 900 points, according to cutoff score data released by Chicago Public Schools. For the fourth year in a row, the Near North high school named after the Chicago Bears legend at 1034 N. Wells St. was the toughest of Chicago's 11 selective-enrollment schools to get into, according to the data. That means successful applicants were docked no more than two points by CPS officials who award the coveted spots based on grades, standardized test scores taken during seventh grade and a high school admissions test. Payton was the toughest selective-enrollment to get into for the fourth year in a row, according to data provided by Chicago Public Schools. Hancock College Prep was not open in the 2014-15 school year. Students who scored lower — but hail from areas of the city identified by data collected by the U.S. Census Bureau as socially and economically disadvantaged — were admitted to Payton as part of the CPS commitment to racial and economic diversity. About 70 percent of selective-enrollment seats are granted admission based on four separate tiers, with students who live in the most affluent tier facing the most competitive scores. On average, students needed to score at least two points higher to win a seat in a selective-enrollment school outright for the 2017-18 school year than for the 2016-17 school year, according to the data. Cutoff scores at Payton ranged from 771 for those living in the most disadvantaged areas to 894 for those in the most affluent. At Jones College Prep Downtown, cutoff scores ranged from 771 to 883. Whitney Young's cutoff scores ranged from 780 to 874, while at Lane Tech, the cutoff scores ranged from 692 to 843. Results were posted and letters were mailed Friday, officials said. That is both good news and bad news, Hawthorne Scholastic Academy Principal Nate Pietrini tweeted. SEHS cut scores went way up. Good news...kids are getting smarter in this district. Bad news...what if you grew a ton, but not enough? In response, Edgebrook Elementary School Principal Chad Weiden acknowledged that left some of his students bereft. 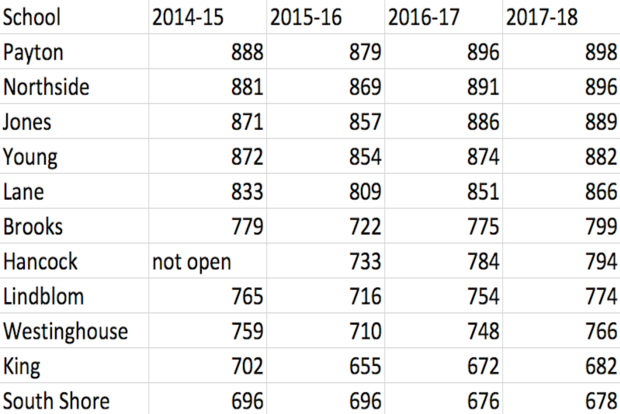 That increase is even more pronounced since the 2014-15 school year, according to the data. The cutoff scores for nine selective enrollment schools — all except King College Prep and South Shore College Prep — rose an average of 8.5 points from 2014-15 to 2017-18, according to the data. King and South Shore are the only selective-enrollment schools where it was easier to snag a seat this year than in 2014-15, according to the data. Chicago Public Schools did not respond to questions from DNAinfo about how many students applied for the 3,600 seats at selective-enrollment schools available for the 2017-18 school year. Two years ago, 13,413 students applied.